Waste of time. They made me feel great about the experience then ruined my trailer. The chemicals used left streaks all down the siding. Not too mention they didnt even finish the job. My wife actually brought our truck back to complain about some paint chips and they lied about doing a walkaraound. If you do this, then you usually sign something. I never did. So if you want to be lied to, have your vehicle and trailer ruined, take a chance, not me anymore. 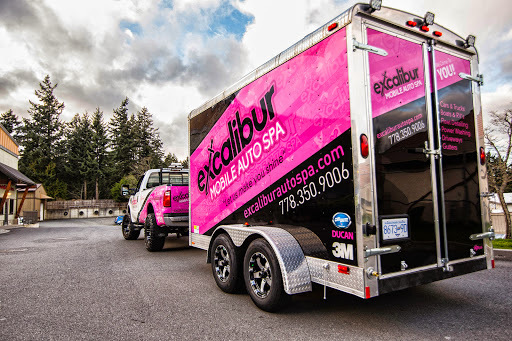 I took my Trail Blazer to the team at Excalibur and I couldnt believe what an amazing job they did on this truck. It was given to me by a family member and was in pretty rough shape...smelled of cigarettes and dogs. They did a complete clean inside and out and then I opted for the Ozone treatment inside to get rid of the smell. The results were amazing. I would definitely recommend taking your car here!! Despite having bought a groupon for the Knight Package (image from Excaliburs site included), we were called and told that the Knight Package only included "light vacuuming" and that our car requires more so wed have to pay more and the groupon would not cover it. Unfortunately, theres nothing on their website that stipulates light vacuuming for the Knight Package, nor is there a footnote of such. I brought my vehicle in for a full package last week. They assured me that even with all the work needing to be done they would have it complete by end of day and they delivered on their promise. The SUV turned out better than it was on day of delivery! The fact that they had a loaner car available made the whole day go that much better! The staff at Excalibur are very friendly and dont make you feel like they are trying to sell you more than you need. They did an outstanding job on my interior and got rid of all the pet hair and odour. Beyond happy with the price and service! The new management has really kicked this up a notch. Service is great, quality is awesome, and delivery is on time.